Although the growth in emerging markets and developing economies is expected to stabilise around 5 percent, the International Monetary Fund (IMF) this week warned that the materialising of any of the key global risks could derail the growth of these economies. 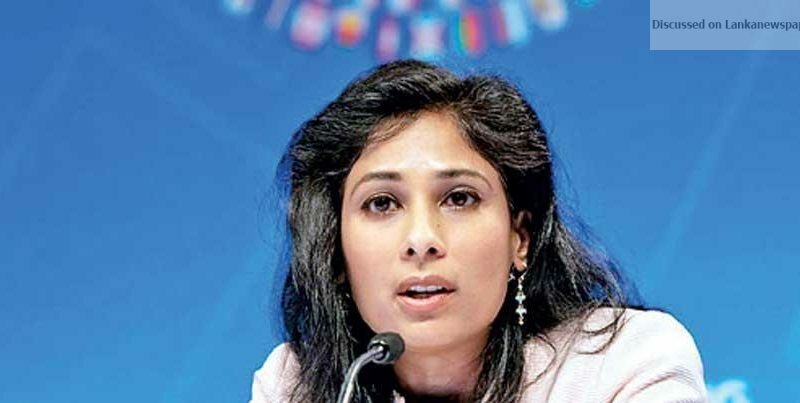 IMF Chief Economist Gita Gopinath said flaring up of trade tensions between the US and China, uncertainty surrounding Brexit and a slowdown in systemic economies and regions such as China and Eurozone could undermine the growth in emerging and developing economies. “If downside risks didn’t materialize, the global economy would rebound. If any of the major risks materialise, the expected recoveries in the stressed and high debt economies and export-dependent economies may derail,” Gopinath told the reporters attending the World Bank/IMF Spring Meeting, in Washington DC, on Tuesday. Sri Lanka’s economy slowed down to 3.2 percent in 2018, as negative political development weighed on the economic sentiment, which led to the final quarter of the year registering a dismal growth of 1.8 percent. Sri Lanka is banking heavily on a combination of exports and foreign direct investment (FDI) to drive growth, albeit both have so far not shown great promise. Exports grew under 5 percent in 2018, slower than the imports. FDI scored a record year, although the majority of it came as proceedings from the leasing of the Hambantota port to the Chinese. Meanwhile, in its latest World Economic Outlook report, the IMF has cut global growth to 3.3 percent this year, from 3.6 percent in 2018, though the multilateral lender expects the economic activity to pick up in the second half of the year and the growth is projected to return to 3.6 percent in 2020. “The downward revision in growth reflects several negative developments in major economies, including the Euro area, Latin America, United States, United Kingdom, Canada and Australia,” Gopinath said. Although the baseline projection for the emerging Asia remains favourable, the IMF expects a slowdown in growth in 2019 for 70 percent of the global economy as opposed to a growth of 75 percent in 2018. “This is a delicate moment for the world economy,” Gopinath said while highlighting the importance of avoiding costly policy mistakes. The Washington-based multilateral lender’s optimism towards growth picking up in the second half appears to derive from the significant monetary policy accommodation by the world’s major central banks. The US Fed, European Central Bank, Bank of Japan and Bank of England have all shifted to more accommodative policy stance, while China has ramped up its monetary and fiscal stimulus. The IMF also noted that emerging markets have experienced some resumption in portfolio flows, a decline in their sovereign borrowing costs and strengthening of their currencies relative to the US dollar. After almost 20 percent depreciation against the US dollar in 2018, Sri Lanka’s rupee has appreciated 4.5 percent so far this year.